S’Mores have been around since the early 1900s. It’s hard to pinpoint who invented S’Mores; some say it was a brainchild of the Boy Scouts and Girl Scouts, while others say the recipe appeared in publications dating back to 1920. Either way, we all can agree that S’Mores are best enjoyed around a campfire with friends and family. With the iconic summer treat on our minds, we’ve created our own version of S’Mores in coffee form! For a limited time, S’Mores coffee is available in custom ground 1-lb. bags and whole bean 1-lb. and 5lb. bags. To accompany our new brew, we have compiled some amazingly ooey-gooey S’Mores recipes. Check out our selection of fool-proof recipes ranging from beverages to cakes. Gather ‘round the campfire with this S’Mores Iced Coffee recipe. It’s everything you would hope for in a S’Mores beverage. 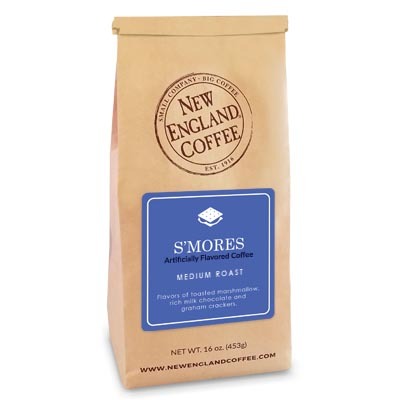 To really enhance the S’Mores flavor, start with chocolate milk and add to New England Coffee S’Mores iced coffee. Top with a whipped cream, marshmallow pieces, crumbled graham crackers, and enjoy! Do you love coffee cake? Want to kick it up a notch? Try this S’Mores Coffee Cake recipe. It’s a perfect sweet treat to enjoy any time of day. Wow your guests with this recipe from Epicurious for a S’Mores Coffee and Fudge Ice Cream Cake is decadent, impressive, and fitting for any celebration this summer. Maybe you want something that requires no baking on those hot summer nights? Check out this no bake Coffee S’Mores Pie recipe. For the craft lovers in the group, this S’Mores Coffee Cup Cupcakes recipe if for you. After baking S’Mores cupcakes, you wrap fondant around the cupcake to create a coffee mug shape! You’ll impress any guest at your next event with these edible coffee mugs. Want to keep it simple and stay true to the traditional form of the classic S’More? Try this sophisticated Caramel Coffee Pistachio S’Mores recipe. This S’More is on another level with the addition of a dark chocolate coffee pistachio bark and a coconut caramel drizzle, YUM! Now that you have some more S’Mores inspiration, gather your friends and family around the campfire and cheers to the S’More this summer.